The Rev. Dr. Jack Sullivan is the new executive director of the Ohio Council of Churches. 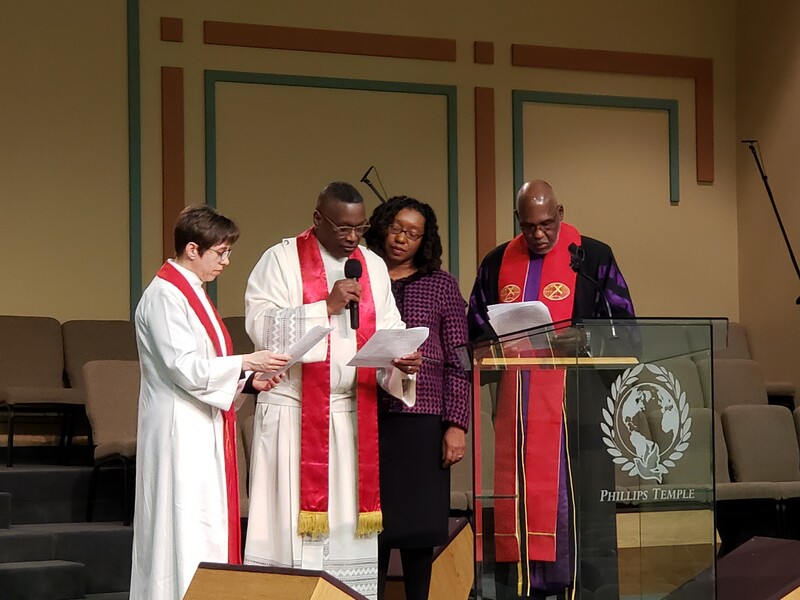 Sullivan, an ordained minister in the Christian Church (Disciples of Christ) in the United States and Canada, was installed during a service at Phillips Temple Christian Methodist Episcopal Church in Trotwood, Ohio on March 23. The East Ohio Conference is a member communion of the Ohio Council of Churches, a 100-year-old State ecumenical organization that represents 17 Christian faith perspectives in Ohio as a platform through which the unity of Christ’s church is made visible. Ecumenism, or promoting unity among Christian churches, is an important aspect of our faith and expression as United Methodists. The Book of Discipline of The United Methodist Church and The Book of Resolutions give permission and encourage local churches to partner and respond to opportunities for ministry with ecumenical partners and to live out the ecumenical spirit in creative ways responsive to the needs of God’s people, as well as to opportunities for expanded mission and ministry (¶207). In East Ohio, the Office of Christian Unity and Interreligious Relationships (OCUIR), chaired by the Rev. Karen Graham, helps the Conference live into ecumenism. The Ohio Council of Churches builds ecumenical relationships and partnerships and monitors and brings awareness to activities in the State legislature that might be of interest to people of faith. Sullivan succeeds as executive director of the Ohio Council of Churches the Rev. Rebecca Tollefsen, who retired in 2018. Tollefsen spoke at Annual Conference regularly and in her last year as director helped organize a bus trip to Washington, D.C. for “Act Now! Unite Against Racism.” She was a tremendous resource and her work at the Ohio Council of Churches has established a foundation on which Sullivan can build. The East Ohio Conference is committed to ecumenical work and working in partnership with the Ohio Council of Churches as well as our many other ecumenical partners. If you are interested in being involved in the ecumenical work of the Conference, please e-mail me at vitality@eocumc.com. *Will Jones is the director of Multicultural Vitality for the East Ohio Conference of The United Methodist Church.